#1 – Amazon is hiring Work at Home Customer Service Reps. These positions are seasonal nationwide for the following states: Arizona, Delaware, Florida, Georgia, Kansas, Kentucky, Michigan, Minnesota, North Carolina, North Dakota, Ohio, Pennsylvania, Tennessee, West Virginia, Wisconsin, and Virginia. #2 – Ask Wonder is seeking students and recent grads for online researching jobs. Starting pay is $0 per brief. As your research skills improve, you will earn around $16-$32 per hour. U.S only. #3 – Support.com is hiring Technical Support Reps to work from home. Starting pay is $10.25 per hour. Required skills are listed on the job posting here. U.S only. #4 – Nat Cave needs a Remote Virtual Assistant. The position is part-time (5-10 per week). U.S. only. #5 – CloudWard is currently seeking Freelance Tech Writers. Worldwide. #6 – Lionbridge seeks Web Content Assessors. U.S only. #7 – Modern Tribe is seeking Customer Care Specialist. Worldwide. #8 – Help Scout is currently recruiting a Remote Designer. Flexible hours with healthcare and other benefits. Nationwide. #9 – Math Elf is seeking Online Tutors. You can make up to $20 per hour. Nationwide opportunity. #10 – Conduent is Hiring Tier Tech Support Agents. U.S only. 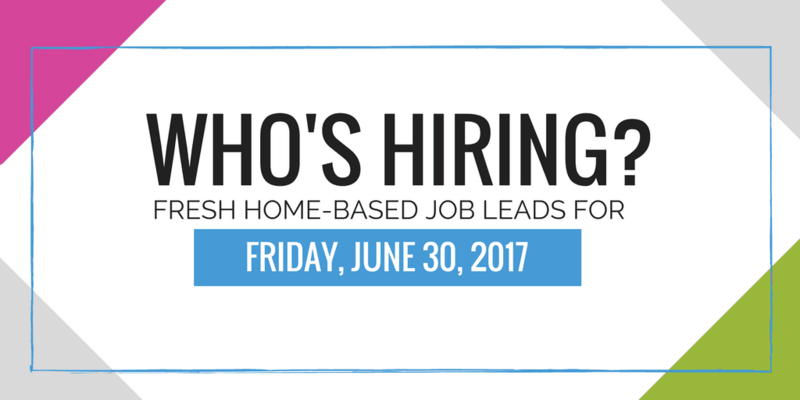 Are there any jobs working from home in Pensacola FL? Hi, Renee! Yes. Are you looking for a specific type of job like customer service, writing, typing, editing, tutoring, etc.? I am looking for something that I can either type or work in freelance writing without all the hassle. (Wonder) is not hiring in New York. Just a note. Thanks.